Center transitways are separated from other vehicle traffic by medians or other vertical separation elements, and prioritize transit movements at intersections. 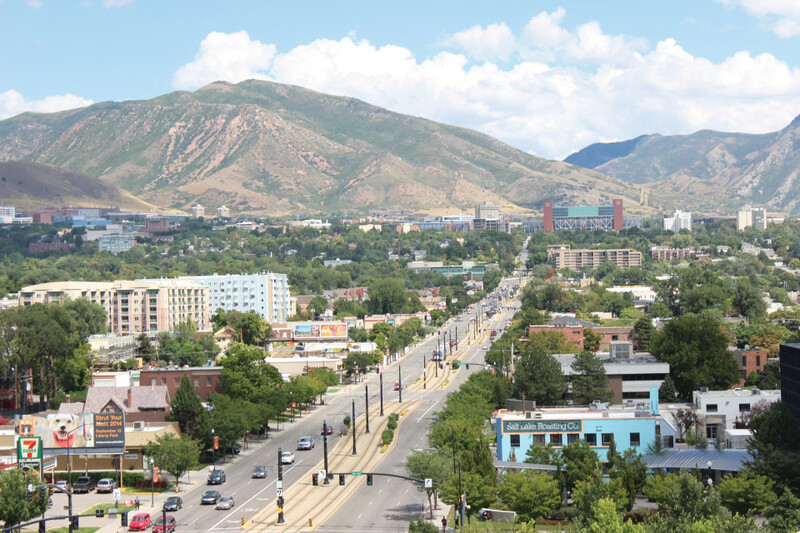 Center transitways provide a high level of capacity and reliability for bus or rail service, and typically require the most space of any transit treatment, with a configuration similar to that of an off-street transitway. They can be configured as shown to support right-side median stops, or with center-median stops. 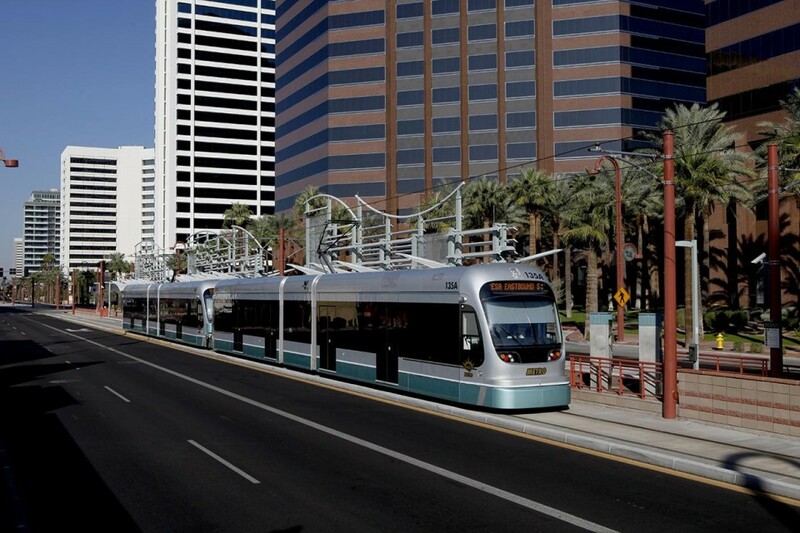 Center transitways are used with high-quality, frequent bus or rail service on very large streets. 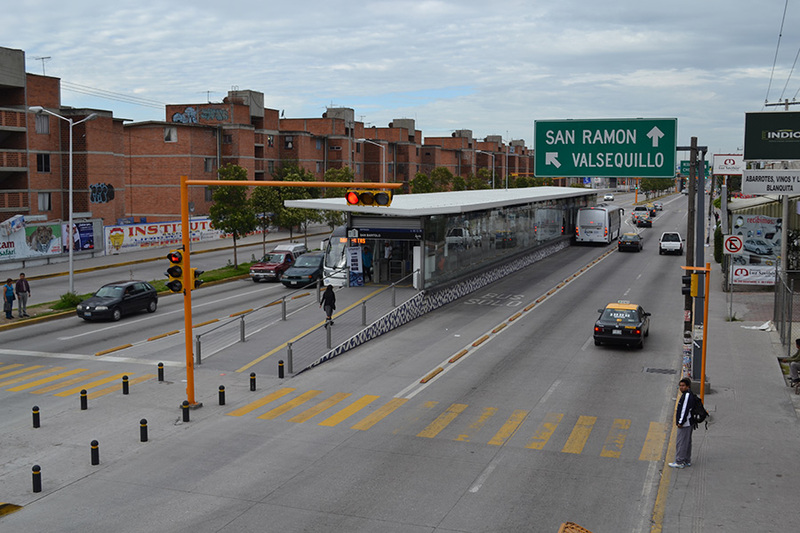 Where right-side boarding is required, such as for BRT services that also operate in curbside lanes, center transitways with right-side medians are a flexible option. When left-side boarding is available, center transitways can be designed either along a median or on the median, with center-median stations. Center transitways, especially those separated by medians or raised above the roadway surface, provide very strong protection from traffic-related delays, both from friction between lanes and from unauthorized use of transit lanes. 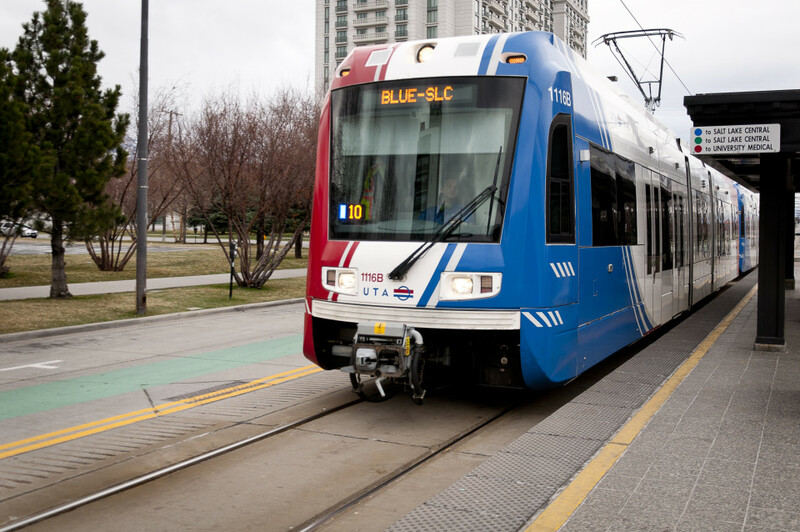 Central transitways allow the highest running speeds among on-street transit facilities, since pedestrians interact with vehicles only at stations and crosswalks, and bicycle use of the transitway is prohibited. 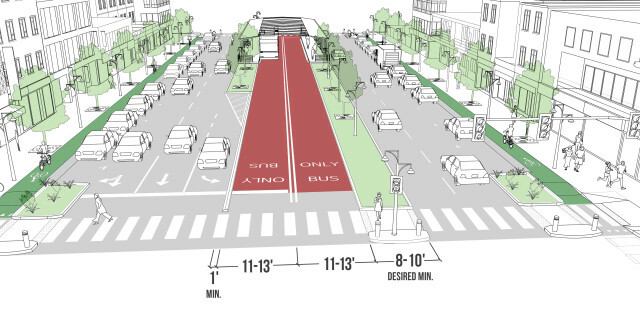 Placing buses in separated space in the center of a roadway improves travel time and reliability by reducing conflicts with parked cars, bicycles, and right-turn movements. Median space can be used for stations, green infrastructure, greenways/multi-use paths, or other public spaces, depending on width. 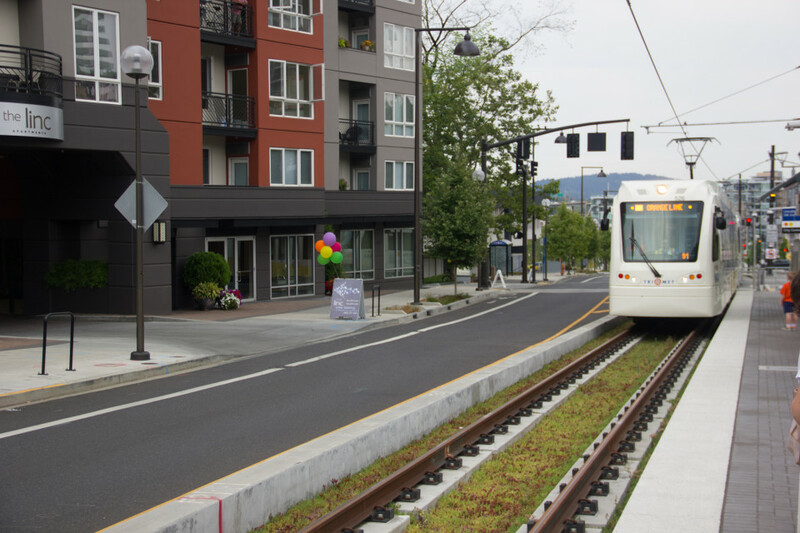 Placed in the median of a multi-lane roadway, center-running rail lines can provide the most robust transit service thanks to dedicated lanes, larger stations, and high-capacity vehicles. Transit speed and reliability on transitways is limited primarily by dwell time. Key rapid transit elements, such as off-board fare payment, all-door boarding, and level or near-level boarding, should be applied to maximize the benefit of a median transitway. Transit vehicles with only right-side doors must either use right-side platforms at stations, or use a contraflow bus configuration with center-boarding islands. Stations for center-median transitways may take up more right-of-way width than curbside-running lanes, since boarding platforms and median strips must be placed between the transitway and travel lanes. Installation should be coordinated with land use changes that maximize potential for transit-oriented development. Land use regulations should be tailored to promote transit use and create a more inviting pedestrian realm. Left-boarding center-median stations reduce this space consumption significantly. The width of a median transit lane must be carefully determined based on the design vehicle’s width and dynamic envelope. Dedicated transit lanes require median boarding islands in the roadway at each stop. These stops must be fully accessible and lead to safe, controlled crosswalks or other crossings. BUS ONLY/LRT ONLY pavement markings (MUTCD 3D-01) emphasize the lane and deter drivers from using it. Since pedestrians must cross to the center of the street to access stations, safe crossings are critical. 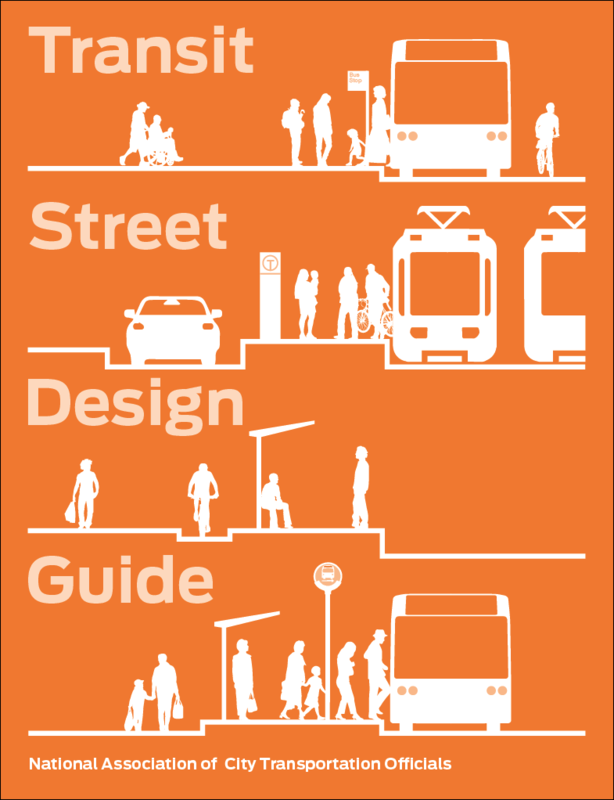 See the Urban Street Design Guide for more guidance on crosswalks and crossings. Transit signal heads should be used at intersections to give transit vehicles priority and avoid driver confusion with general traffic signals. Ensure that pedestrian refuge islands adjacent to transitways are wide enough to allow large groups of people to wait, particularly near stations. Discourage pedestrians from waiting in unsafe locations in the roadway, especially near railways. Where spacing between parallel tracks provides no clear zone between passing LRVs, clearly indicate the danger area and discourage pedestrians from waiting in this area. Intersections with pedestrian, bicycle or motor vehicle cross-traffic must be signalized. Intersection design should reflect the presence of the transitway, with markings through the intersection to show the transit vehicle travel path. Red color markings or pavement should be used to emphasize dedicated median transit lanes and deter drivers from entering them. Color application may be limited to the intersection approach to save application and maintenance costs. Should be implemented alongside complementary rapid transit elements, such as off-board fare payment, transit signal priority, and level boarding. Construct transitways with concrete or other highly durable material, rather than asphalt, to minimize maintenance costs. Median configurations can permit transit vehicles to bypass one another at stops, such as with a center-median transitway that has both local and express routes, an important consideration to avoid delays. Even if the initial service provided on the transitway serves all stops, building passing opportunities into the stations allows for greater service flexibility in the future.